One of the most exciting things about the Southern Heights Food Forest is the opportunity it presents to explore the relationship between community, food, and education. By utilizing a research-based design approach, we are aiming to create not only a dynamic social space, but also one that increases environmental literacy among people of all ages. Also referred to as “Forest Gardening,” this technique of gardening exercises the concepts of permaculture (permanent agriculture) to produce a more sustainable, productive and diverse supply of food. Plant material in a food forest is not only based on the production of food, but also on mimicking natural relationships in nature that create more diverse ecosystems. To paraphrase author and educator Dave Jacke, it’s less about gardening in a forest and more about gardening like a forest. Permaculture is organized around the idea that each plant and element serves multiple functions. The biodiversity found within these designs makes the spaces more resilient and self-sustaining, which ultimately make the harvests more diverse, productive, and less labor intensive. 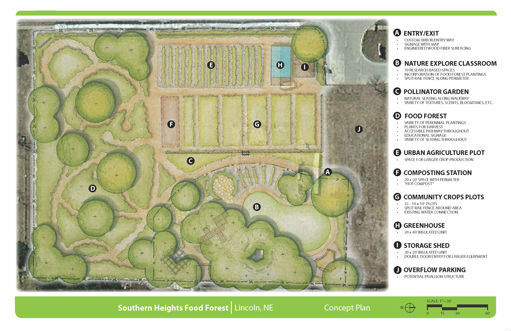 Following new trends in global urban agriculture, the Southern Heights Food Forest will be the first space of its kind in the state of Nebraska. While one of the immediate benefits of this element is food production, there is also the opportunity to educate the public on the value of whole foods and eating locally. This element will bring national recognition to the project, and our hope is that we can inspire similar educational endeavors in other communities and states as well as additional forest gardens throughout Lincoln itself. Nature Explore Classrooms are intentionally designed, nature-based outdoor spaces developed around research-based, field-tested design principles focusing on youth education and whole-child development. By engaging in these dynamic, interactive spaces, children of all ages are challenged to think independently, master new challenges, develop increasingly complex skills, and closely observe and appreciate the natural world. Composed of natural materials and “loose parts” elements that encourage open-ended play, these spaces offer a strategically balanced array of activity and education, providing an alternative response to traditional playground environments. Over the years, Nature Explore has established itself as a global leader in the design and use of outdoor educational environments. As a multi-disciplinary team of Education Specialists and Landscape Architects, the Lincoln-based nonprofit has worked with agencies all over the world designing outdoor spaces and conducting a variety of dynamic workshops that facilitate a positive relationship with nature. Can you visit? Yes! Please visit. Read this to learn more. Our collective project includes community garden space that serves ~40 families on about a half acre portion of the larger Food Forest project site. These families are going their own food to feed their own households. We love watching what they are doing, and learning about the plants that are important to them, but we do not harvest from these plots, only those families do. While Food Forest visitors are welcome to stroll through these gardens and observe the wide variety of foods being grown here, please remember that these plots are the work of private individuals striving to feed themselves and their families. This space has seen a variety of uses over the years. We are now clear that the soil in this zone will require additional repair work to become robust and healthy, so that will be the focus for the next year or two. With improved soil, our hope is to begin using this space to propagate plants from those that are robust and happy on our site. These plants will be ones we know work together well and can thrive in urban settings in southeast Nebraska. Our hope is to spread small collections of these plants around town and around the region to other educational, faith, and neighborhood settings where they can continue our mission of creating community by creating an abundant habitat.